Many people think that the best burger is one cooked outside on the grill. But this burger recipe, made on a countertop grill or grill pan, proves them wrong. With some simple additions and techniques, you can have a great indoor-grilled burger. Part of its flavor comes from adding a few key ingredients to the ground beef, such as an egg. Also critical to this burger's success? Lightly toasting the bun in the pan you used to cook the burgers, to soak up all the delicious juices. If you opt to use leaner meats like lean ground beef, bison, or turkey, adding eggs, Worcestershire sauce and molasses will make your burgers juicier and more flavorful. Using a grill pan or countertop grill allows you to mimic the char you get on an outdoor grill, which adds to the grilled flavor. Another trick is dimpling the burger before you grill it. The patty will contract as it cooks and this keeps it flatter without a hump in the middle. As with any burger, it's up to you how rare or well done you want your meat. Although there are risks of bacteria when meat is too rare, sometimes with this recipe leaving a little pink in the middle makes it extra tasty. For the well-done crowd, leave your burger on the grill for an additional 2 to 3 minutes to give it that extra sear that mimics an outdoor-grilled burger. Gather the ingredients. If your meat is frozen, let it thaw in the refrigerator overnight before cooking. In a mixing bowl, combine the ground meat, egg, Worcestershire sauce, molasses, garlic powder, salt, and pepper. Divide the mixture into four pieces (if desired, use a kitchen scale to make sure each weighs about 6 ounces). Form each piece into a ball, then press lightly with your thumb in the center of each to make a doughnut-shaped patty. Heat a countertop grill or grill pan to medium-high heat (around 375 degrees). Grill the burgers until they are cooked through, about 6 minutes each side. The safe cooking temperature to reach for ground beef, turkey and bison is 160 degrees Fahrenheit. If desired, top the burgers with cheese and melt the cheese by either covering the grill pan briefly with a lid or by transferring the burgers to a sheet pan and placing them under the broiler for a few minutes. Keep warm. 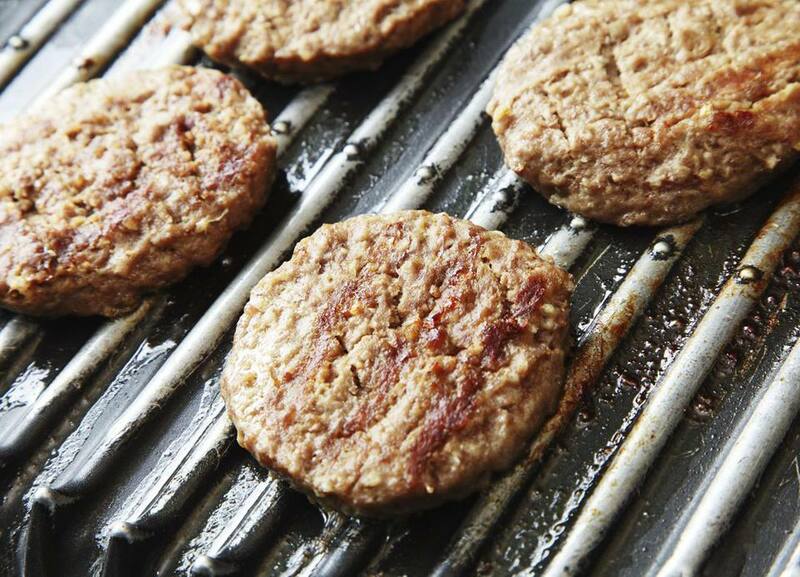 Place the buns cut-side down on the surface of the hot grill, pressing lightly to let buns soak up any juices. Toast the buns lightly until golden. Serve the burgers on the buns with your choice of condiments, such as ketchup, mustard, pickles, sliced tomatoes, onions or lettuce. If you have any leftover burgers, wrap them and store them in the refrigerator. Use them within three to four days.